Webster/Franklin Sts one-way couplet (14th St to 25th St): bike lanes, winter 2012, funded by a Transportation Fund for Clean Air grant from the Bay Area Air Quality Management District and Alameda County Transportation Commission. In spring 2012, wayfinding signage was installed along this and the connecting bikeway described next. Franklin St to 25th St: bikeway, installed July 2012. Funded by Federal Stimulus dollars as part of a multi-street resurfacing contract. 25th St to the I-580 overpass: first installed in 1998; restriped in July 2012 as part of a multi-street resurfacing contract. I-580 overpass to 38th St: bikeway, installed 2013-2015, funded by Kaiser Hospital as part of their hospital seismic retrofit/upgrade project. 38th St to Broadway Ter: bike lanes, installed December 2014, part of a Federally-funded multi-street resurfacing contract. Related signage along Broadway from Golden Gate Wy to the Kay Overcrossing was installed in 2010 as part of a larger corridor sign project spanning from College Ave to Skyline Blvd. A signage project under development will fill the gap between 41st St and Golden Gate Wy. 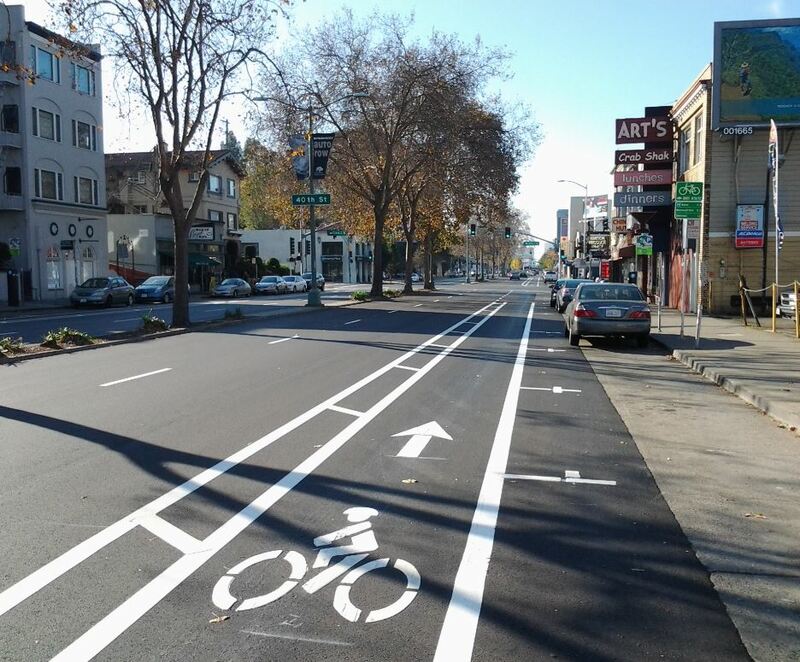 Buffered bike lanes were installed on Broadway, 38th St to Broadway, in December 2014.